Poor @HillaryClinton has blamed so many people for her historic loss there will be no one left to buy her book . Thursday, September 9, 2017. Yet another death in the never-ending Iraq War, Christians remain targeted but so does pretty much everyone else in Iraq, Klan Hillary continues to use veterans as a prop, and much more. Noor Faleh Rassan al-Khazali of Iraq is dead. He died Tuesday in Arizona. Khazali was conducting a routine training mission, 1st Lt. Lacey Roberts said. 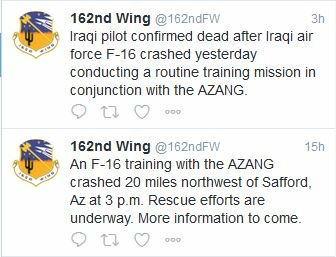 The U.S. Air Force has assembled a safety board to investigate the crash, which is the second involving an F-16 from the 162nd Wing and the third F-16 crash in Arizona since mid-2015. An Iraqi brigadier general was killed when his F-16 crashed during night training near Douglas, Ariz., in July 2015. AP repurposes THE STARS AND STRIPES article here. In Iraq, the war continues as does the persecution. Do we want to be the generation that stood by as Christians disappeared almost entirely from the ancient homelands they have occupied since the days of the New Testament? Will the Trump administration and this Congress let this historic and preventable tragedy happen on their watch? We are on the precipice of catastrophe, and unless we act soon, within weeks, the tiny remnants of Christian communities in Iraq may be mostly eradicated by the genocide being committed against Christians in Iraq and Syria. Other global crises such as North Korea's nuclear adventurism may be dominating the headlines, but this tragedy has been unfolding in agonizing slow motion over the past decade, an unintended consequence of the turmoil and sectarian strife unleashed by the Iraq war of 2003. Saddam Hussein was hardly a protector of Christians, but the power vacuum that came after his fall made the plight of Christians in Iraq dramatically worse. The George W. Bush administration tried to help persecuted Christians and other religious minorities, but had its hands full avoiding defeat in the larger civil war. Whatever respite Bush's surge decision bought soon gave way under the Obama administration to an even more terrible extermination campaign launched by the Islamic State, leading to a charnel house of death and displacement for Christians. 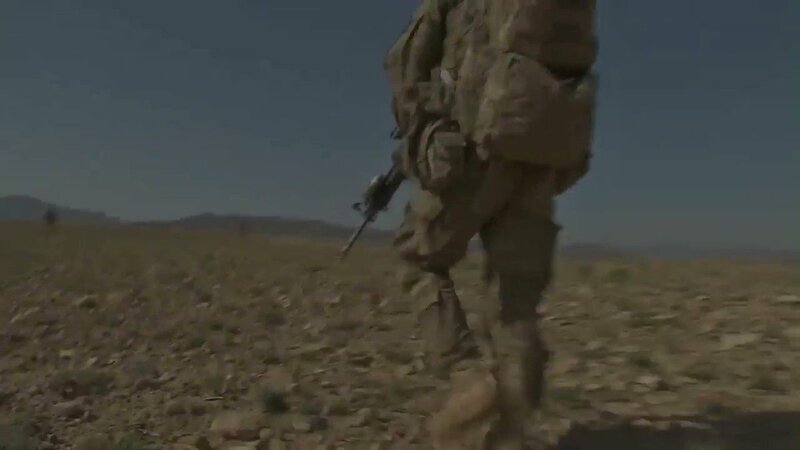 In turn, the Obama administration found itself making its own painful tradeoffs as it tried to fight the Islamic State while relying on local militias that had designs on Christian lands. The result was an accelerated Christian exodus and extermination of those who stayed behind. Bureaucrats in the Obama administration compounded the problem by blocking efforts to direct some funding to help local church groups and other religious organizations that were providing almost all of the humanitarian assistance to the suffering Christian communities. Their rationale stemmed from a benighted misinterpretation of humanitarian principles and a desire to avoid the appearance of favoritism when there were so many suffering groups. Such head-scratching punctiliousness prevailed despite the Obama administration's own public recognition that the Christian and other religious minorities like Yazidis were the victims of genocide and faced extinction unless they were helped. Wassim Bassem (AL-MONITOR) also notes a bleak future, "Christian leaders say Iraq's monasteries and churches could soon become mere relics unless something is done to curb the violence against Christians. During an Aug. 26 press conference, Syriac Catholic Patriarch of Antioch Mar Ignatius Joseph III Younan described Christians as 'the most targeted and most vulnerable' minority in the region — and not just because of the Islamic State (IS)." "We as Iraqi Christians call for an independent state, even if it is a small one like Kuwait or Vatican. The UN and UN Security Council should then protect our state," Robert Jameel, a member of Etihad Church in Baghdad, told Rudaw correspondent Bahman Hassan. Iraq was home to over 1.5 million Christians before the country plunged into bloody sectarian conflict in 2003. "We call for a state because we have suffered a lot. We have no support and have lost faith in everything. That is why we call for a state for the Christians," added Jameel. Non-governmental organizations in the Kurdistan Region have told Rudaw English that prior to the rise of ISIS in 2014, they estimate 400,000 Christians lived in all of Iraq. Since that time half of Christians have emigrated from Iraq, leaving less than 200,000 Christians mostly in the Kurdistan Region. After all, the threat of ISIS has not disappeared. If anything, with human rights abuses carrying on against Mosul's beleaguered citizens – 40,000 of whom perished in the U.S. backed campaign to "liberate" the city and family members of alleged ISIS fighters being sent to byzantine "re-education" camps – the sectarian divisions exploited by the Islamic State will likely endure. According to a recent Human Rights Watch report, the U.S.-trained Iraqi 16th division has been linked to war crimes in Mosul. "Human Rights Watch has documented Iraqi forces detaining and holding at least 1,200 men and boys in inhumane conditions without charge, and in some cases torturing and executing them under the guise of screening them for ISIS-affiliation," the report reads. It also details the discovery of a mass execution site, gruesome accounts of decapitation of women ISIS fighters, and children as young as 14 with alleged ISIS ties being summarily executed and left to rot in the sun. Lawyers are now being arrested for representing ISIS suspects and tried for their supposed crimes in kangaroo courts. The head of the Iraqi government's Shia Endowment, Alaa al-Mousawi, has called for non-Muslims to convert to Islam or be killed. And while the UN, Amnesty International and other international agencies have urged action for several months on the horrors unfolding in Mosul, so far, Prime Minister Abadi has offered little more than lip service. Let's wrap up with this. Please watch this. Many #dreamers & immigrants were part of our 1st Armored Division team in N. Iraq. They sacrificed, gave their lives. Thousands of patriotic #Dreamers who served our nation in uniform are at risk of deportation due to @realDonaldTrump's cruel #DACA decision. They sacrificed, gave their lives. Well apologize to them for sending them into an illegal war. As for the always laughable VoteVets -- a front organization for the Democratic Party. We made that call years ago. Got nasty e-mails from a few VoteVets for doing so. Thing is, everyone who e-mailed back then later e-mailed to say that, yes, turns out it was a front group. So mean old Donald Trump is going to deport some vets? In my best Bette Davis: So what? I'm getting really tired (a) of vets being used as props and (b) of them being treated like children. Why, goodness me, it looks like an induction ceremony at Camp Victory taking place July 4, 2006. (Click photo for screen-resolution image);high-resolution imageavailable. In recent years, becoming a U.S. citizen has become much easier and faster for thousands of noncitizen servicemembers. In July 2002, President Bush expedited the naturalization process for servicemembers through an executive order that states legal permanent residents serving in the U.S. military are immediately eligible to apply for naturalization. The order also states that legal permanent residents who were on active duty on Sept. 11, 2001, or after, but have since been honorably discharged from the military are also eligible for expedited naturalization. According to USCIS, more than 16,000 service members have requested expedited citizenship, and more that 8,000 have been sworn in as new U.S. citizens. Twenty-two servicemembers have been naturalized posthumously after being killed in Iraq. The Immigration and Nationality Act requires aliens to reside in the United States for at least five years after being lawfully admitted before applying for citizenship. That wait is three years for service members who are legal residents. However, President Bush waived the time limits for service members serving during periods of military hostilities, such as the war on terrorism. According to the USCIS, the general requirements for servicemembers to become U.S. citizens are that they demonstrate good moral character, have a knowledge of the English language, U.S. governments and history, and take an oath of allegiance to the U.S. constitution. Servicemembers also must prove U.S. residency. Additional benefits for servicemembers that recently went into effect include no-fee filing for naturalization, Aguirre said. And, he added, soon the naturalization process will be available to servicemembers at overseas locations, such as embassies, consulates and military installations. If you were a service member meeting the above, you had an easier road to citizenship than any non-military Dreamer. So let's stop the nonsense. I'm someone who believes we should have a blanket amnesty. I can make the case for that and some would agree and some would not agree with me. But if we had that and then two years later someone was whining -- and I use that term intentionally -- 'Oh, I'm about to be deported!' The first question would have to be: Why didn't you use the amnesty period? I can't hold your hand and walk you through life. Some veterans faced with deportation currently may have a very good reason for not utilizing the tools available. Some. But these tools were available and service members had access to them. Failure to utilize the tools available? Maybe you were afraid, maybe you weren't sure you wanted citizenship. They aren't weak, they survived the military -- and in some cases war as well. They also had an easier path to citizenship than most other immigrants in the US currently. Most of all, stop hiding behind veterans. I'm so sick of Klan Hillary that can't make a political argument (sound-byte) without trying to hide behind veterans. Homeless veterans, before Barack failed them and broke his promise, got attention. This country should be ashamed that anyone in it is homeless. The US Congress should be forced to give up their vacations each year until significant decreases in the number of homeless takes place. But that's not the case. We've gone from George H.W. Bush stepping over them as he walks with a reporter interviewing them, to basically the entire country stepping over them and acting like they're invisible. Klan Hillary's fine with that. The rest of us shouldn't be. She's attacking Joe Biden now? why is hillary so damn violent? Even her pantyhose turned on her!